Toy Fair New York 2017: Funko brings us a plethora of products, some seen before and some new. Toy Fair New York 2017: BB-8 is almost ready to roll out for us to buy! Toy Fair New York 2017: Check out the latest products from Imperial. Toy Fair season continues. Take a look through our galleries of Star Wars related products at Toy Fair New York 2017. Toy Fair New York 2017: Browse through the latest costumes from Rubies. Toy Fair New York 2017: Asmodee and the latest Fantasy Flight Games releases. Toy Fair New York 2017: Buffalo and their collection of new products. Toy Fair New York 2017: We looks at the science-focused range of Uncle Milton products. Toy Fair New York 2017: Revell reveal their range of products. Toy Fair New York 2017: We looks at Vandors range of products. 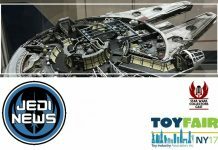 Toy Fair New York 2017: Tamashii Nations present their new range of figures and vehicles. Toy Fair New York 2017: Flick through the new Silver Dolphin releases. Toy Fair New York 2017: Marvel at the wooden wonders of IncrediBuilds. Toy Fair New York 2017: Take a spin through the Mattel car fleet. Toy Fair New York 2017: QMX present their latest high-end release. Toy Fair New York 2017: Comic Images bring the plush to TFNY. Toy Fair New York 2017: Check out the original chewy, Jelly Belly. Toy Fair New York 2017: We looks at the Tin Box Toy Companys range of products. Toy Fair New York 2017: Check your decks for the latest Cartamundi releases. Toy Fair New York 2017: Kotobukiya present their new range. Toy Fair New York 2017: Hasbro present their range of Roleplay and Games. Toy Fair New York 2017: Hasbro present their range of Galactic Heroes, Potato Heads and Play Doh. Toy Fair New York 2017: Hasbro present their range of 3.75” Figures, 12” Figures and More. Toy Fair New York 2017: Hasbro present The Black Series range of 40th anniversary products. Toy Fair New York 2017: Hasbro present The Black Series 6" and Centrepiece range.